Top 3 TRX Suspension Trainer Alternatives - Go with the Best. The TRX suspension trainer carries an expensive price tag, and it can be a very troublesome challenge to find a budget friendly TRX alternative that is just as strong, durable and effective. We have done the dirty work of identifying the top rated alternative suspension trainers that you can use instead of the TRX & never feel the difference. Is TRX – the Original Worth it? BUT, some of us (or many of us) don’t care about these add-ons. We may have our own routines or trainers to work with. We just need a suspension trainer to get the benefits out of suspension training. TRX may just be too expensive for our budget. Conclusion: You just got a home gym set up with powerful equipment all within the price of a TRX. Justified below in detail are the top rated alternative TRX trainers available at Amazon.com – my preferred shopping site. They are almost a quarter to 1/3rd of the price, and they still get the job done. If you are living in the UK, Click Here. Most customers found the main advantage to be the price. It’s half the price of the TRX whilst matching the quality standards. Some claim it to be better than the TRX itself but that could be a simple exaggeration out of sheer excitement of owning a pair of suspension straps that saves you a whopping 50% or more in comparison to the Original TRX suspension trainer. Another benefit of this product is the sturdiness and durability. Although many suspension trainers claim to hold more than 500 to 1000 lbs, the creators of the Body-weight fitness trainer kit decided to stay humble by claiming to support upto 350 lbs, which it does perfectly according the claims made by most customers. The soft foam door anchors is one of the key advantages of this product. Not only does it protect the door edges and the door frame, it’s also an incredible simple concept that makes the door anchor more sturdy and stronger than the usual anchor systems used in other suspension straps. This gives the Bodyweight trainer kit a whole new advantage over other suspension trainers. 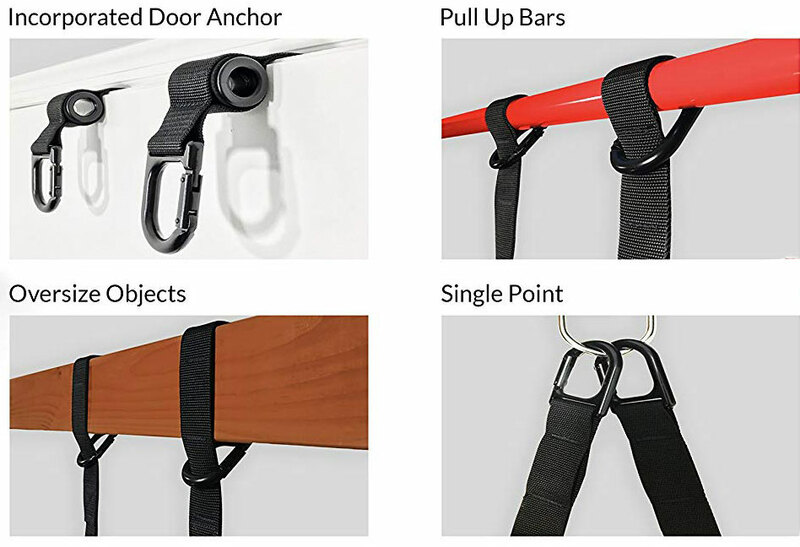 What most customers DO complain is about the lack of a X-Mount or an anchor to mount the straps to the wall or ceiling, but the TRX does not come with an X-Mount either. The original X-Mount is quite expensive but now you can find cheaper alternatives for the mount itself. That being said, one must understand TRX at it’s original price does not come with an X-Mount and the best alternative so far, the Bodyweight Fitness Trainer kit, at fraction of the price does not come with a X-Mount either. It’s not fair to expect more out of a cheaper alternative when the benefit is already visible. The dual straps is another great plus point of the product according to some reviews since it allows for more ranges of motion you couldn’t get with the single strap motion. For example: Suspension strap pushups can be performed with better quality when the straps are apart unlike the single strap version. 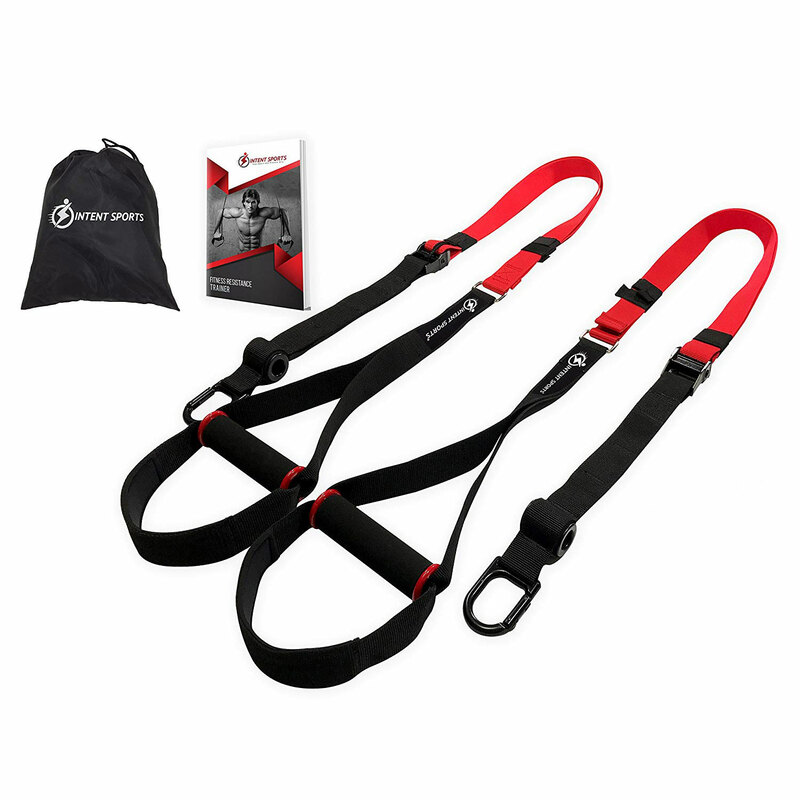 Overall, the Bodyweight Fitness Trainer kit is a great alternative to the TRX suspension straps. Not only is it cheaper, but it has a few key features up its sleeve that makes it appear more beneficial than the Original TRX itself. White markings on the strap makes it easy to remember the level of resistance used for each exercise – perfect solution for progressive overload training. 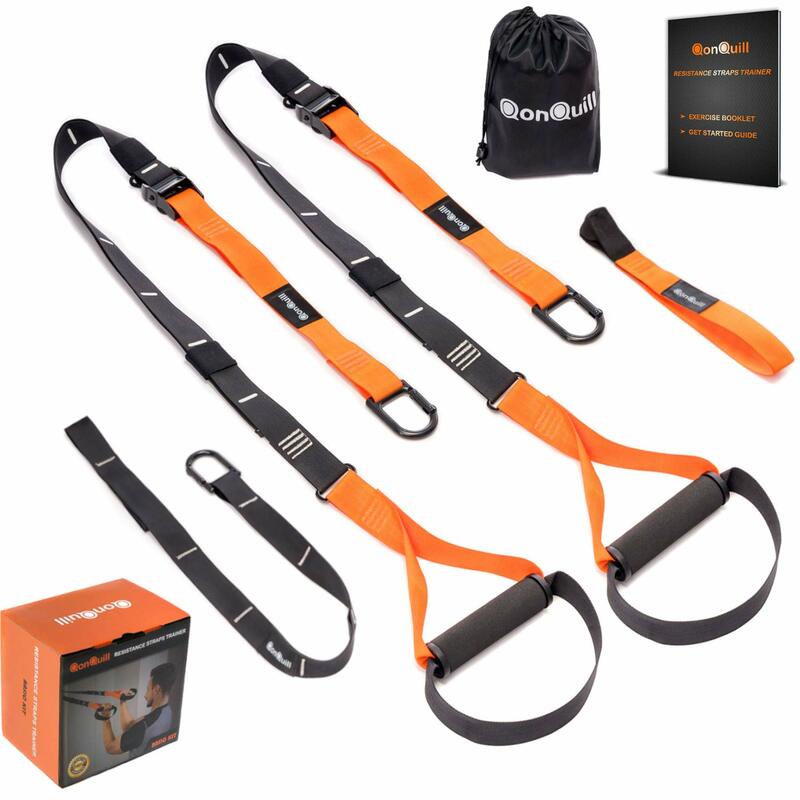 The key benefit highlighted by most customers of the QonQuill Bodyweight Fitness Training Kit is the strength and durability of the product. Not only is it made from high quality webbing, but it has fulfilled its claim of being able to support upto 400lbs. There is a slight difficulty to figure out how to use the extension straps for the first time, but the creators of the QonQuill suspension trainer are pretty quick at responding to any messages you send to them using the Contact option at Amazon.com. The quick response by the creators is a beautiful feature that most customers praise about the product. There are some reviews by customers who has used the product for longer than a month and it’s all praises about the value for money in comparison to it’s original alternative, the TRX suspension trainer. It’s very rare to find actual negative feedback about this product. We could find only 2 to 3 negative reviews, and most of them don’t stand fair to be called a review. One customer had given a one-star rating for not including an X-Mount. Even the TRX training kit does not include an X-Mount, so that’s not a fair opinion. Another negative review was based on the assumption that the straps are too thin. The customer is afraid to use it. It could be a fair review, if actually tested and the weight doesn’t hold for real. What we DO like about the QonQuills resistance straps is the simple line stripes. When lifting weights, it’s easy to track progress by recording how much you lifted on the previous workout. It was difficult to do that with the TRX. This product however has the while stripes, which can easily help you mark which line was previously used to perform the movement. It’s not a 100% accurate way of tracking your progress, but this is a wonderful step in that direction. Door Anchor: Slip over any standard home or office door. We hope this page was helpful in helping you decide on the best non-TRX suspension trainer. It’s time to avoid excuses and start with your fitness plan as fast as possible. I had a wonderful experience with the TRX at the bootcamp last month. I got the Qonquills Suspension Trainer at Amazon last month. It was only $49 when I got it. I also got the X Mount Anchor to hang the TRX from Wall / Ceiling… You should mention that on your page too for your readers. It would be very helpful to use an X-Mount anchor with the suspension straps. Hi, I’m glad you like the read. The Qonquills is a wonderful product. You should be glad you got it. It has the resistance levels marked with white lines. Makes it easy to observe those strength gains. I personally use the Wall Mounted chin up bar to hang my suspension trainer. Thanks for the comment tho. Love to see feedback like this!